CINV is classified into 3 categories—acute-onset CINV, which occurs within 24 hours of initial administration of chemotherapy; delayed-onset CINV, which occurs 24 hours to several days after initial treatment; and anticipatory CINV, which is triggered by thoughts or anxiety that patients associate with previous chemotherapy. 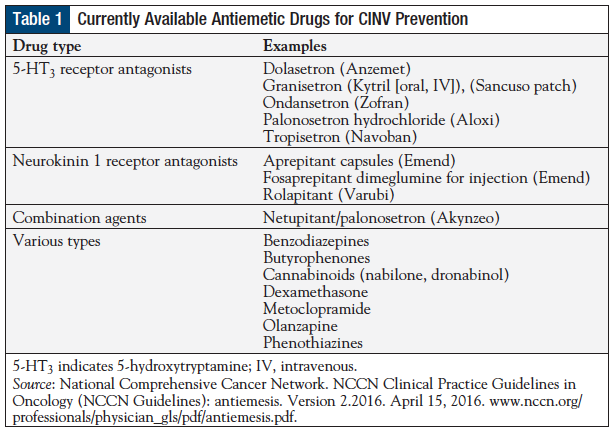 Combination antiemetic regimens are the standard of care for controlling CINV.6 Examples of antiemetic drugs that are available in the United States are summarized in Table 1. The primary end point was the proportion of patients who achieved complete response, defined as no emetic episodes (vomiting or retching) and no use of rescue medication, during the acute phase (0-24 hours) and the delayed phase (>24-120 hours) after chemotherapy in cycle 1. 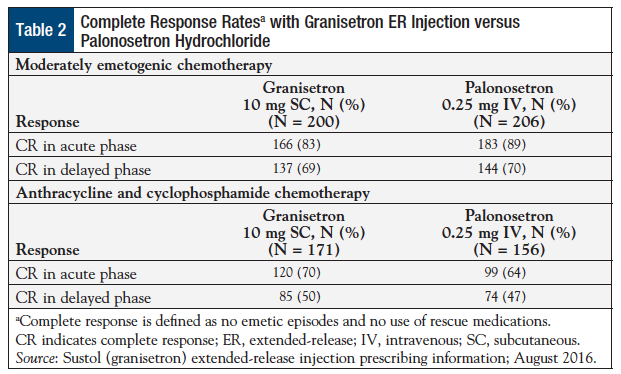 The noninferiority of granisetron ER injection to palonosetron hydrochloride was demonstrated in the acute and delayed phases of MEC or anthracycline plus cyclophosphamide combination chemotherapy.11 Of the 200 patients who received granisetron ER injection and MEC, 83% achieved complete response during the acute phase, and 69% achieved complete response during the delayed phase. Of the 206 patients who received palonosetron hydrochloride and MEC, 89% achieved complete response during the acute phase, and 70% achieved complete response during the delayed phase (Table 2). Granisetron ER injection is the first 5-HT3 receptor agonist to receive FDA approval for the prevention of CINV. When used in combination with other antiemetic drugs, granisetron ER offers an effective and safe alternative for patients undergoing initial and repeated courses of MEC or anthracycline plus cyclophosphamide combination chemotherapy. Using a novel drug delivery technology to maintain therapeutic levels of granisetron for ≥5 days, this long-acting agent is an important new treatment option for patients with cancer, in part because adherence to consensus antiemetic guidelines remains low. As a single injection, the use of granisetron ER may prevent acute and delayed CINV associated with MEC or with anthracycline plus cyclophosphamide combination chemotherapy. Copyright © 2016 American Health & Drug Benefits. Used with permission. Sun CC, Bodurka DC, Weaver CB, et al. Rankings and symptom assessments of side effects from chemotherapy: insights from experienced patients with ovarian cancer. Support Care Cancer. 2005;13:219-227. Feyer P, Jordan K. Update and new trends in antiemetic therapy: the continuing need for novel therapies. Ann Oncol. 2011;22:30-38. National Comprehensive Cancer Network. NCCN Clinical Practice Guidelines in Oncology (NCCN Guidelines): antiemesis. Version 2.2016. April 15, 2016. www.nccn.org/professionals/physician_gls/pdf/antiemesis.pdf. Accessed August 18, 2016. Burke TA, Wisniewski T, Ernst FR. Resource utilization and costs associated with chemotherapy-induced nausea and vomiting (CINV) following highly or moderately emetogenic chemotherapy administered in the US outpatient hospital setting. Support Care Cancer. 2011;19:131-140. Morrow GR. The impact of chemotherapy-induced nausea and vomiting. Clin Adv Hematol Oncol. 2014;12(3 suppl 9):3-4. Hesketh PJ. Chemotherapy-induced nausea and vomiting. N Engl J Med. 2008;358:2482-2494. Multinational Association of Supportive Care in Cancer. MASCC/ESMO Antiemetic Guideline 2016. 2016 V.1.2. www.mascc.org/assets/Guidelines-Tools/mascc_antiemetic_guidelines_english_2016_v.1.2.pdf. Accessed August 19, 2016. Hesketh PJ, Bohlke K, Lyman GH, et al. Antiemetics: American Society of Clinical Oncology focused guideline update. J Clin Oncol. 2016;34:381-386. Rugo HS. Management of chemotherapy-induced nausea and vomiting in clinical practice. Clin Adv Hematol Oncol. 2014;12(3 suppl 9):9-11. Heron Therapeutics. Heron Therapeutics announces FDA approval of Sustol (granisetron) extended-release injection for the prevention of chemotherapy-induced nausea and vomiting. Press release. August 10, 2016. www.businesswire.com/news/home/20160810005389/en/Heron-Therapeutics-Announces-U.S.-FDA-Approval-SUSTOL%C2%AE. Accessed August 18, 2016. Sustol (granisetron) extended-release injection [prescribing information]. Redwood City, CA: Heron Therapeutics; August 2016. Raftopoulos H, Cooper W, O’Boyle E, et al. Comparison of an extended-release formulation of granisetron (APF530) versus palonosetron for the prevention of chemotherapy-induced nausea and vomiting associated with moderately or highly emetogenic chemotherapy: results of a prospective, randomized, double-blind, noninferiority phase 3 trial. Support Care Cancer. 2015;23:723-732.